The heavy green door opens, and I walk through the space created by squeaking hinges and into a hallway. Old carpet, matted down by hundreds of kids, scratches underneath my feet. I want to reach out and drag my hand along the brick wall as I head towards the gym. Do all of these buildings smell the same? It’s got to be something they pump through those public school vents mixed with smelly adolescent boy, and girls still trying to figure out just how much Clinique Happy they can get away with. This week, I got invited to a junior high talent show. Part of the organization I work for has a homework helpers tutoring program, and one of the young men who participates tried out for the 6th grade talent show, and was selected to perform. I don’t have a relationship with this kid – working on the administrative team, keeps me somewhat removed from the face to face interaction with those we serve. However, my co-worker was so excited for this little guy’s performance and she invited me to go with her and watch. He had been practicing all week – taking any opportunity to share with anyone who would listen, the song he was going to play. And so, on Friday afternoon, we stepped away from the office and got to go back to junior high – just for a few moments. Now I don’t know about you, but for most people, I think junior high was some sort of version of well, hell. Too many hormones, braces, boys, dances, and popular kids. I survived junior high ok, skating through in the “just popular enough” clique, but as I sat in that gym I could not help think that this school was very different than the one I attended. And it is just across town. This school faced many more challenges than the school I spent my days at – more diversity, the highest poverty rate in the district, the most ESL students (and not just Spanish speakers), and the lowest test scores. As someone who has a sociology degree, these things fascinate me. I do not know much about the interactions of what goes on at this school beyond the demographics captured in statistics. What I do know, however, is that the way these 12 and 13 year olds came together for just an hour was special. Students danced, read poetry, played piano, sang loudly, and nervously poured their hearts out into their special talents. When it came time for our kiddo to perform, he was so nervous, but timidly played his guitar and sang and students applauded. Standing ovation. When, along the line, do we become so obsessed with ourselves that we stop applauding each others talents? You don’t typically see adults coming together to do talent shows – at least not formally. I sheepishly admit some of my interests and capabilities. Again, I fail to celebrate my talents on a regular basis. Maybe I’m dealing with some insecurity here, and I can certainly appreciate fantastic people, but I have a hard time appreciating the ordinary about others. Ordinary or not, I was inspired for genuine appreciation for talent demonstrated by a bunch of sixth graders. They taught me that I need to appreciate the talents of those I love, of those I admire, of those I’d like to learn a little bit more about, those that I would like to learn from. I want to reclaim an appreciation for my talents, my hobbies, and the things I bring to the world. 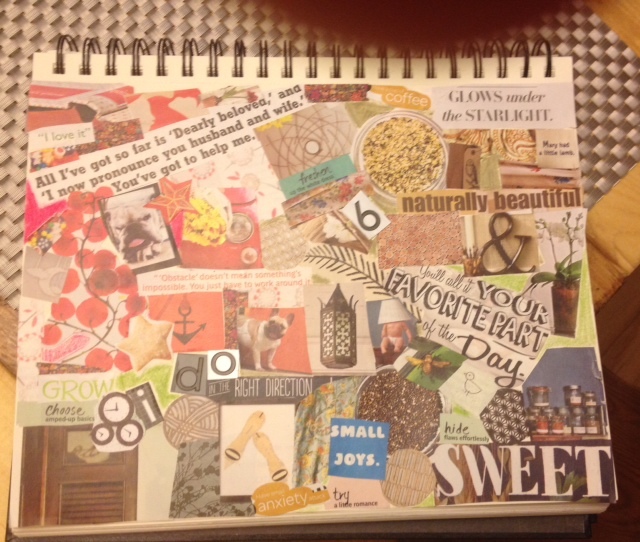 So, tonight, I invited a friend over, had some wine and created a collage. I haven’t done this in ages. When I was 12 and 13 my bedroom walls were literally covered with homemade collages – teen icons, faces of cute boys, and Lisa Frank, and inspirational quotes – I would spend hours creating these snapshots of life. I think, and my parents can correct me here, I had three collages – a triptych if you will – of one poster board of just eyes, one of noses, one of mouths. It hung on my wall as a weird homage to beauty magazines – my first stand against what the world tells us we should look like. I have dabbled in this method of capturing myself for years – but for one reason or another have taken a hiatus. Maybe too much else was going on in my head and my heart – it was difficult to put it on paper. But tonight I did. I set an intention, and sat down to appreciate a talent of mine that I was missing. Here’s what I created. Be kind please. What do you appreciate about yourselves? About others? Have you had any touching moments this week?